Slide the hard plastic insert into the top sleeve (Fig 1). Place items like recovery gear, clothing, towels, first aid kits, road side equipment, snacks, etc. in the main compartment A. Place smaller items in the outer mesh pocket B or the zippered pocket C (Fig 2). 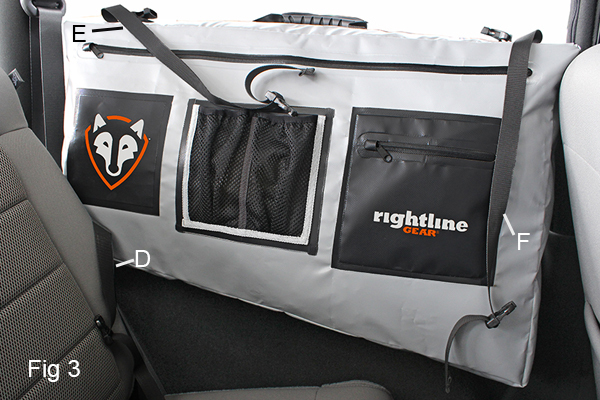 Position the bag over the driver’s side rear wheel well (Fig 3). The top of the bag should follow a straight line parallel to the ground. The outer pockets will face towards the inside of the vehicle. Buckle the D strap around the base of the rear vertical roll bar, without twisting the strap (Fig 3 and Fig 4). Buckle the E strap around the rear vertical roll bar, above the seat belt holder, without twisting the strap (Fig 3 and Fig 5). Buckle the F strap around the front vertical roll bar, above the seat belt holder, without twisting the strap (Fig 3 and Fig 6). Tighten all (3) straps. The top of the bag should follow a straight line parallel to the ground (Fig 7).